Nestling in the lap of the Himalayas, Sarahan, situated an an altitude of 7,100 feet above sea level is small hill station in Himachal Pradesh which is known for its natural beauty. It is also a sacred Hindu spot mentioned in Puranas, some of which associate the place with Lord Krishna. According to Legend, Sarahan was once ruled by king Banasura. He had a beautiful daughter named Usha, who once saw a handsome young man in a dream. She discussed about this dream with her friend Chitralekha. Based on Usha’s description, the friend drew an image of the man- Aniruddha - the son of Pradyumna and the grandson of Krishna, who resides in Dwaraka. Chitralekha with her magical power, took Aniruddha to Usha’s place. He too falls in love with her. When Lord Krishna was informed of this incident, he assumed that it was abduction and this led to a war. Banasura was defeated and Sarahan became the capital of Bushair State. Sarahan is famed for its ancient Bhima Kali Temple. It is regarded as the site where Lord Krishna fought against Banasura. It was mother goddess Bhimakali(an incarnation of Goddess Durga) who killed him in a fierce battle. 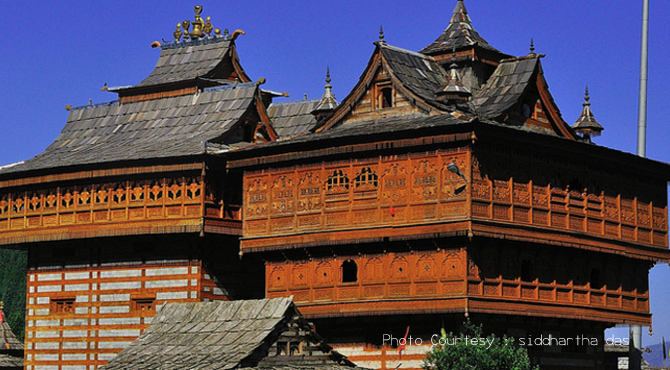 One of the most beautiful and ancient temple, the temple is situated about 180 km from Shimla. Considered to be at least 800 years old, this is one among the 51 Shaktipeeths and it is believed that the left ear of the Goddess Sati fell at this place. The temple complex, spread over one acre is dominated by two towering structures. The first tower, damaged in an earthquake in 1905, is no longer in use; the second tower, a replica has been constructed in 1943, houses the main temple. The main temple, built with wood, is a three storeys temple. It's architecture is a mix of architecture mix of Tibetan and the local Pahari styles. It has unique carvings, slanted slate roofs inspired by Tibetan architecture, golden towers, pagodas and a six silver coated door. It houses a golden image of the Goddess about 210 years old Bhimakali resides on the top floor of the temple. This image is not open throughout the year for worship. But , the one at the second floor is worshipped daily. Below the floor houses, the icon of goddess Parvati, the divine consort of Lord Siva. The temple complex houses four other temples, namely, Raghunath Ji, Narsingh, Lankravir and the Hanumanji temples. It is sited above the edge of the second court yard. Considered to be 800 years old, the temple has fringe clusters at the corners of its roofs as multiple pendants. Two arched windows of carved wood, one rectangular window and pierced wall openings for ventilation and light is a worth to see. The diety here is considered as the guardian deity of mother goddess. The temple is positioned in one of the subsidiary buildings to the right side. It is said that human sacrifices were performed until the mid 19th Century. It houses a deep dark hole that has very steep steps which leads darkness. Towards right of the temple complex, near the 'Shanti Kunj' (heritage palace of Raja Padam Singh) is a temple dedicated to Shri Hanumanji. Here, the temple's diety is housed in a wooden structure. Reaching a few steps up from the road to the paved courtyard is the special enclosure of a Sikhara Temple dedicated to Lord Narsingh. One can see many sculpture fragments of stone and relief sculptures that repeat the overall contour of the temple. The Bimakali temple attracts visitors during Navaratri and Dusserah. Other major fairs celebrated with gaity and fervour are Janamashtami, Ramnavmi, Makar Sakranti, Shivratri and Diwali. Three day Dussehra fair dedicated to Raghunathji is celebrated every year with a great joy. Rath Yatra of Lord Raghunath Idol is attraction of festival. On this day, the idol of Lord Raghunath is taken out in a procession to the Padam Palace. It is said that, at the Lankra Vir Temple, human sacrifices were carried out right up to the 18th century. The custom still lives now, and animals like goats, chickens and buffaloes are ritually slaughtered as a sacrifice to Goddess instead of human sacrifices. A large festival is held during Dusserah at village Sarahan with animal sacrifice playing a big role in the festivities. Throughout the day, 4 aartis are performed. Generally devotees can have darshan between 6 am (during summer) / 7:30 am (during winter); 2 hours after the first one ; At noon (During this time, local foods are offered to the Goddess) and finally in the evening (shlokas from the holy and religious books are chanted during this time). Offerings performed in the temple are Flowers, Dhoop, Incense, Rice, Camphor, Clove, Cardamom, Kumkum, vermillion, etc. Note: Males must wear a cap to enter the Bhimakali Temple and cameras and leather goods like belts and wallets must be left with the guards. There is a museum at the temple complex which has good collections of ancient utensils, arms, dresses, etc. Tourists can also visit the nearby regal residence named as Padam Palace.